The last few mornings we have been experiencing blissful states of 5D energy waves streaming into our awareness. This is perfect as it sets the day of higher consciousness for us to be aware of and bathe ourselves in. This is a direct result of the September Waves. The energy lasts all day as opposed to the previous states of bliss that might last a few hours. Changes like this have to be noted, as this is how we move dimensions. I have been in seclusion during this gateway of the Equinox to the Blood moon week due to wanting to completely immerse myself in the energies/waves coming in. 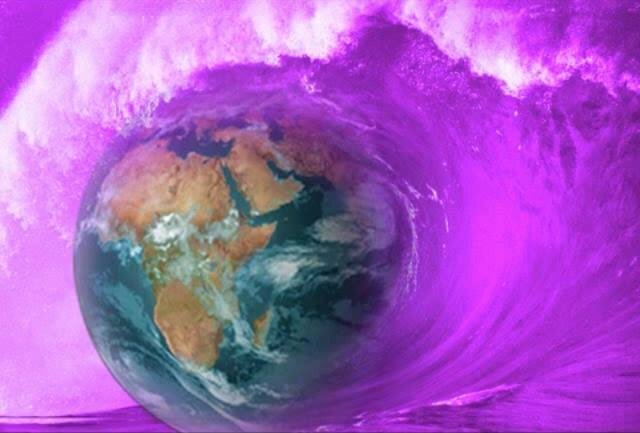 Since I have not posted an article since before the Equinox, I will go backward in September to recap in energy has taken place and include the energy we are headed in to. The Blood moon on the 28th was an intense Supermoon that culminated in new beginnings for us all. Yes we have passed a marker this month propelling us higher and higher dimensionally. I found myself on the EVE of the blood moon very emotional and with spurts of crying/melancholy feelings. It is very important in this shifting process that we honor all feelings that come in, whether they be positive and into states of bliss or the more cleansing waves that we sometimes have to go through to get to the other side. This release of crying is symbolically releasing as the old way of life leaves us and we start the NEW journey now into the 5th dimension and beyond. We can think of this as a marker in time. It marks the end of one journey of 3D and the beginning in another. We experienced some intense waves on Equinox Eve. They were dizzy, foggy brain waves that hit our consciousness and pulled us out of this 3D reality for a short time. Then, on the day of my interview the 24th, with Michelle of In5D, we experienced the same thing for a few hours before my interview. Even during the interview I found my consciousness slipping back and forth. I wanted to make it through the interview the best I could but I found I was slipping in and out of 3D reality and into unlimited Time or NO time. I pulled myself back in every time a question was asked. The weeks before this gateway we experienced Crown chakra activations that came in regularly, flares or no flares they were occurring. This is DNA activations coming in from the higher dimensions. Towards the beginning of September we experienced HUGE waves for 3 days. This may have been the beginning part of Wave X. The waves were unprecedented and the details can be found here and here in my earlier articles. We experienced tremendous symptoms and huge downloads came in. All of September has been energy packed with today 9/29 and 9/30 we received a Bliss upgrade of 5D energies streaming in to solidify the energies that have come in all month long. I had many 5D experiences which I have talked about in all my articles. One recent experience my grandson had a few days ago. He called to me to tell me what he had experienced. He was sitting at his XBOX playing and saw one of the controllers that was sitting on the table next to him move by itself. If I were a 3D grandparent I would have told him this is not possible or he only imagined it. Yet I am not, I am a 5D unlimited being of light and love just like all of us. I told him yes it’s very possible he experienced the controller moving on its own since I have seen similar occurrences myself. I once saw a plastic bag that I left on my floor moving out of the corner of my eye. When I stopped and looked over at it, it was dancing for just for a split second in time. It then realized the program must be started again and laid back on the floor. These are glimpses we have into 5D where everything we think here, is NOT that way in the higher realms. These experiences will become more common place for everyone. How are the chakras related to the Shift? I have been asked what a person can do to raise their vibration, this is one of them. Each chakra must come into alignment for the body to stay balanced and for us to align ourselves with Source Energy. We can do this by visualizing each chakra spinning starting with the root chakra and work our way up to the crown chakra until they are all spinning in harmony. This is best when done with relaxing music. Each chakra gets cleansed as it spins and as it is cleansed it also becomes more open to receiving the energy that runs through the body. We can visualize each chakra spinning, being cleansed and then move onto the next energy center until they are all spinning together. This can be very invigorating so I don’t advise it to be done before bedtime. Each chakra must open and be able to receive. Every chakra will also vibrate at times. I have experienced vibration in every energy point on the body. When my heart chakra was opened fully in 2011 a white pointed light came through my window heading straight into my heart. I had some pain and slumped over a bit but it soon passed. The white light was sent from Source to completely open and heal my heart energy point. I felt wonderful and refreshed afterwards. If you feel pain in your heart chakra or vibrations this is the heart center expanding and opening. The waves we have been experienced will keep coming in through October. Dr Simon Atkins talked about this on his video of 9/29 and confirmed what I have told to others. These waves are unlike others as I mentioned earlier in the article. For those that have asked me will the Shift happen all at once or a gradual change taking place, it will be gradual and we are in that gradual process right now. Our body needs time to adjust between waves and to fully integrate our new DNA. As we raise our vibration it is important to understand how the higher dimensions operate. There is no negativity there, so all must be removed here first. We must come into alignment with the Truth which is the Source Creator. There is one truth and this is not perception, it is All that is . Psychic abilities, 3rd eye openings and all things psychic are now in the process of happening to everyone, at different rates. Leaning to maneuver these realms is not always easy. Fear stops all higher awareness. This is why it is so important to be plugged into the Universal Truth, there is no fear there. As more and more move into the higher realms they will have a chance to see UFOs and Star Beings as I do. This is one way you will know you have moved into 5D consciousness. We will not be able to see these beings if we are still in judgment about others. They don’t all look like us. Some look very human but others do not. There are many races with their unique features and we have to be open to accepting others that do not look like us. I have had two different races visit me with bluish skin and both looking different from each other. Many of the others look very human. We must suspend all judgement and fear when it comes to our Star friends. All 5th dimensional experiences are blocked by fear. Fears must all be faced and dealt with. The Event may not happen exactly the way it has been forecast to. The event will be when we reach a tipping point of mass consciousness shifting into higher awareness. This will also coincide with more and more people seeing UFOs and Star Beings. We will not need disclosure. We will all be seeing beings from other dimensions with the combination of our third eye and physical eyes (some of us already do). The third eye and physical eyes work in combination with each other after a person reaches a more advanced stage of third eye opening. They work in harmony with each other, so much so that I don’t always know what I am seeing with one or the other. I understand it may be difficult for some to understand but eventually with everyone ascending, everyone will be experiencing more of the same experiences. Waves are energy bursts of light that come into our consciousness from many different sources. These many times come with downloads and upgrades of information for us. They can change our level of DNA. They provide us with 5th dimensional consciousness so we know more than we knew the day before. They provide us with the consciousness of knowledge, wisdom and the ability to go back and forth in time to know what is taking place. This means more psychic abilities and higher level consciousness. We may not understand something that happened in the past but now with our expanded awareness, we can instantly know things we could not know before. This will seem normal as time goes on, being able to maneuver in more than one dimension at the same time. This is where we are headed. We have October now to look forward to after September being packed full of Waves, coming in all different forms and energies. Many new insights, new light, and new ways and waves of being. Many are now awakening as the light makes it more and more difficult for those unawakened to stay asleep. If you are still dealing with a family member who is still unawakened, there may be resistance in the beginning. Many asleep will not be able to understand the higher realms mindset because they have not yet experienced it for themselves. Resistance many times takes the form of lashing out because the false ego can not believe the shift could be going on and they have not experienced anything yet. When the ego gets upset and in fear, it lashes out and goes into complete denial, then blaming the messenger for feeling uncomfortable. This is part of the 3D society to live in fear of things we have not experienced and can not understand. We can not let this stop us from spreading the message of the Shift. In time even the most die hard non believers will be given and shown a chance to believe. This is when we reach the tipping point, for once awakened can never go back to sleep again. There is only progression toward higher consciousness in each waking moment. Every moment then becomes an opportunity to be more and experience more than we ever thought possible. Many are starting to experience this now. As we move dimensions, things will start to seem UNREAL here. This is already taking place. It is important to note, we do not move dimensions all at once, it is a process. So whatever we experience we accept and move on from that point. It is about acceptance and releasing what no longer works, from ourselves and our lives. As 3D turns into 5D many things will have to change, we see the evidence all around us. I AM living in each moment of the Now. I AM self loving in every action I take. I AM honoring my 5th dimensional way of being. I AM unlimited in my power and experiences. I have the POWER to Create ANY kind of reality I desire. I Am a Creator, as everything is a Creation of what I AM honoring in MY LIFE.